Sa Seung Bong Do is my favorite place in Korea. What I heard is that the island belongs to some lady who wants to keep it undeveloped. She does, from time to time, allow people to rent the island for camping purposes. There is a care taker there who stays in a little cabin, but other than that the place is deserted. 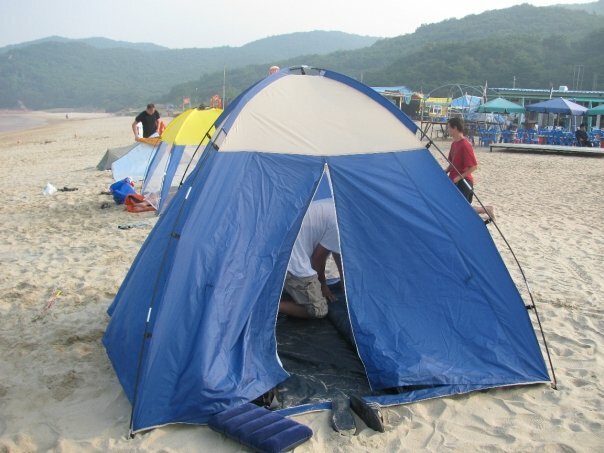 You can rent tents, but you have to pick them up from Seung Bong Do, the island you go to before going to Sa Seung Bong Do. Mark and I were not among the people who rented tents. I had seen a nice 2-person tent at Lotte Mart a few weeks earlier and bought it. It’s a lovely blue tent that’s pretty easy to set up and tall enough for me to stand in. 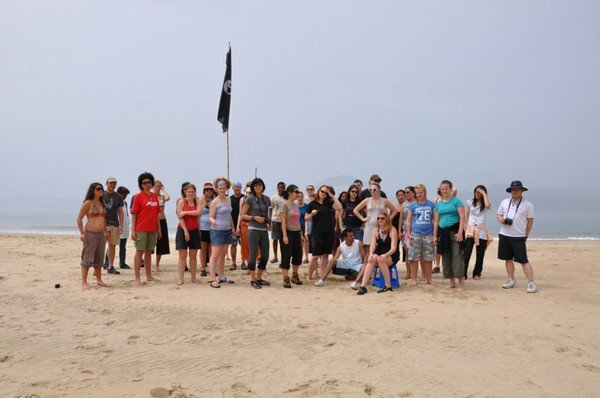 The first day of our trip we found our spots and set up our individual tents and the community tent. It was a very beautiful island, but we could not see it. It rained all day creating a heavy fog. It gave everyone a feeling of awe at being in such a wonderful place and misery because everything was cold and wet. The rain also made everyone a bit moody. Mark decided that he had had enough with just sitting around and being wet. He talked a couple other guys into helping him build a fire in the rain. Everyone else said that it couldn’t be done. “You can’t make a fire with wet wood.” I think that even Mark didn’t believe it was possible. He was just too bored not to build a fire. They started out with paper cups and chopsticks for kindling. They drowned it in lighter fluid then added wood to it. They, one by one, ran off into the forest to get more wet wood for the fire. In just one hour they had a roaring fire going. The fire seemed to draw people out of their tents and the great cooking began. We had burgers, hot dogs, and Hobo Stew. The stew was the idea of Susan. You make a pocket out of foil paper, add water, vegetables, meat, and whatever else you would like, season, fold up shut, and place in the fire to cook. 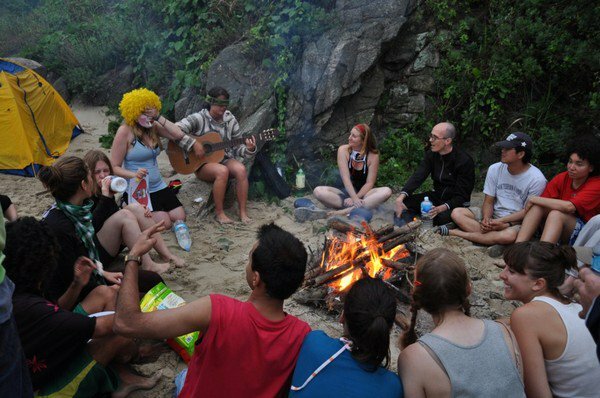 At night many people got drunk and sat around the fire singing songs and playing a guitar. Things can get crazy on a lonely island and several people got hurt. It wasn’t anything serious, just a bruise here and a cut there; nothing a good first aid kit couldn’t handle. The next day there was no rain, just sunshine and happiness. I was one of the first people up and one of the first to see the mess left after a night of drinking. 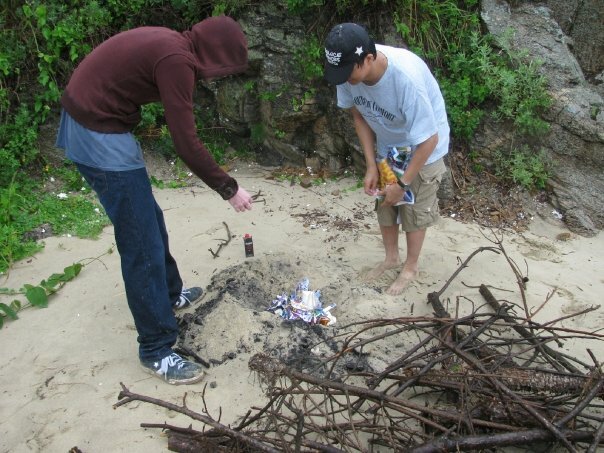 As I, along with a few other people, cleaned up we found cameras, flashlights, and underwear sticking out of the sand. The rest of the morning was spent frolicking in the water and running way out to sea. 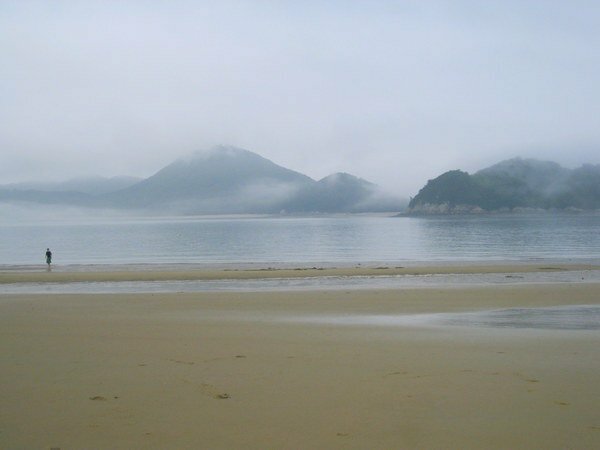 The tide goes out very far on the east coast of Korea. It leaves interesting ridges on the sea floor which feels really nice on the feet when you walk across it. We did have a lot of fun goofing around while making breakfast after the clean up. Our horse-play resulted in a casualty for one little pancake. We couldn’t just throw it away; we had to make a whole event of it! It was sad to leave. Although I had only been there for about 24 hours I really fell in love with the island. I must get an island of my very own someday. 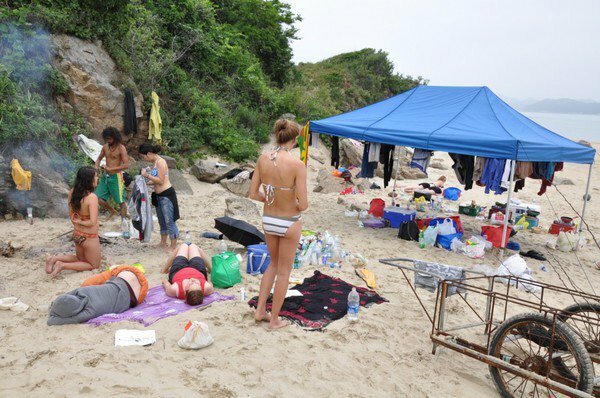 The easiest way to get there is to join meetup.com, find William, and beg him to organize another trip to Sa Seung Bong Do. 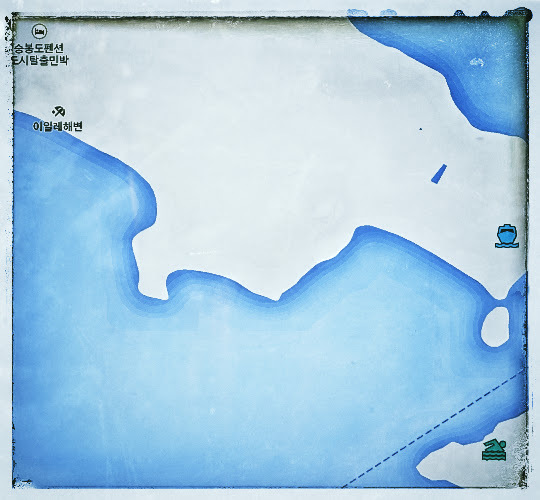 I don’t know who William called to arrange a stay on the deserted island, but I do know how to get there from Seoul. Take the line 1 subway to Incheon station. That’s Incheon station, not Incheon Airport. Don’t get the two confused; they are not near each other at all. Once at Incheon station take bus #720 to Yeonan Budu Ferry Terminal. It’s a blue bus. Another way is to take bus #1600 from Seoul station. This one is a red bus. You can get to it by going through exit 2 of Seoul station and walking to where all the red buses stop. This bus also stops near Hongdae Subway Station. 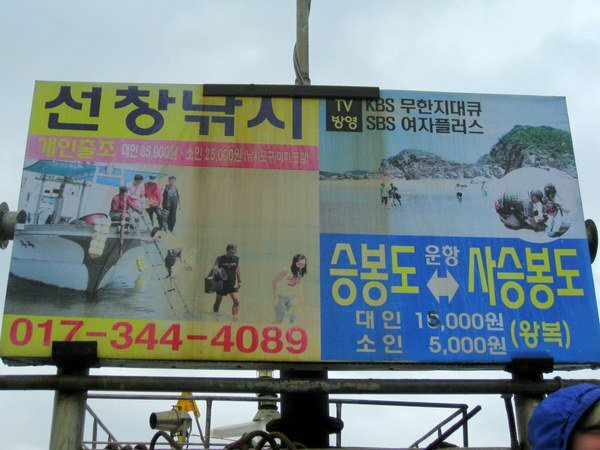 You can get a ticket for a 2 hours boat ride to Seong Bong Do (승봉도), another island off the coast of Incheon. Now, this is where William worked his magic. He hired a couple of boats to take our group to the island of Sa Seung Bong Do. According to a sign on the island you should call 017-344-4089 to reserves a boat. I think the boat ride costs 15,000KRW for adults and 5,000 for kids. So give that a try. I have no idea. William set everything up and he priced everything to include food. There might be seasonal restrictions on when people can stay on the island. 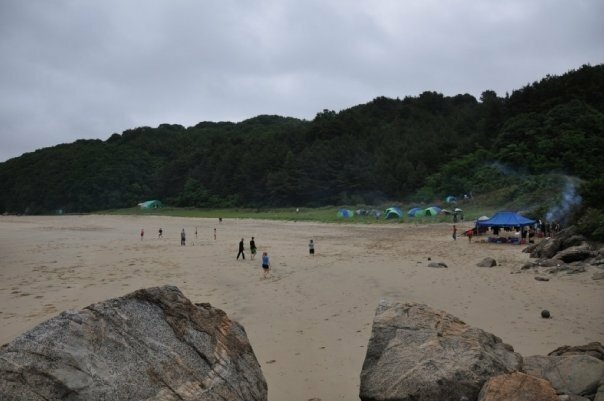 If you are buying camping equipment in Korea during the summer, you are in luck. Every halfway decent grocery or department store (Lotte Mart, E-Mart, Home Plus, etc) will have a camping section. They will sell both name brand expensive stuff and the store brand cheaper stuff. They’re all good, so don’t feel like you have to spend a lot of money for good equipment. I bought a decent 2-person tent (that could actually fit 4 people) for about 40USD. If summer has just passed or it’s not quite summer yet, too bad. The only places that sell camping things at these times are camping stores. They only sell high-end camping gear for hard-core campers with lots of money. My advice is to just not camp until summer. Stay in love motels or rent your equipment when possible, until you see the camping gear in the department stores. Honestly, it would be cheaper to order your camping stuff from Amazon.com (use the global shipping option) than to buy most things for sale at any of the camping stores in Korea.